I’ve moved into a fairly close-knit community with a vibrant social center in Western Massachusetts, and I went for a walk with my boyfriend downtown from our house on a large hill, late last night, to see if the town’s annual bonfire was still burning. There’s only one street light at the top of the hill and we walked in near darkness until we reached the town center at the bottom of the hill. If my boyfriend hadn’t been with me, I probably would have turned back. The only marker’s we had were a few fireflies now and then, blinking in the grass and bushes at the road’s edge. Crickets and tree frogs filled the humid night air as we walked hand in hand – occasional rustling from some other animal breaking into the night chorus – filling me with fears of bears and wolves, while my real fear should have been skunks searching for grubs. Being sprayed by a surprised skunk would have kept away any bears or wolves, but everyone else as well! As we walked down the street, we saw great flames and sparks streaming up into the sky, lighting a wide expanse around the park. We continued around the park’s edge to the playground and swung for a while, watching the emanated light show, and hearing the chatter of several generations around us. 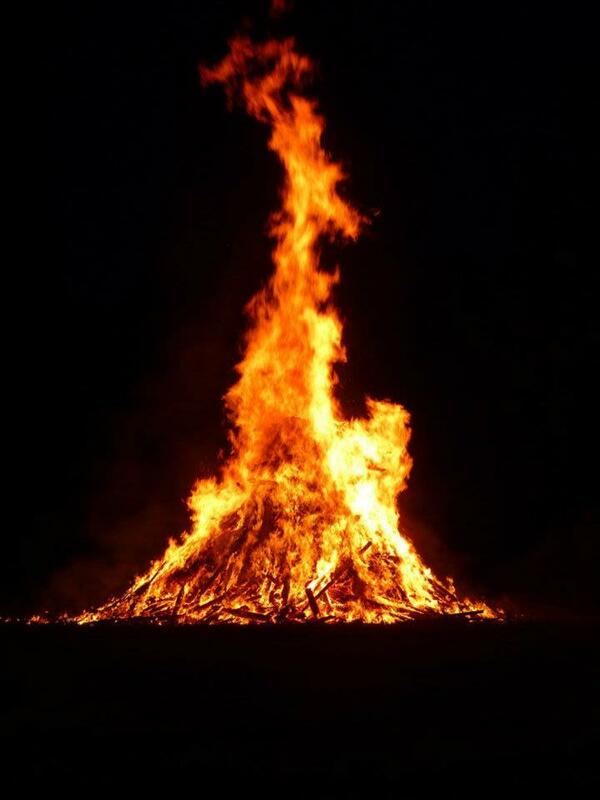 I felt linked to all the people there, as well as those from bonfires past – and to cultures who’ve used bonfires to mark celebrations and festivals throughout time. The fire and sparks shimmered in the night air, sometimes looking like mini-fireworks, other times looking like live creatures taking flight from their great burning mother. I stepped backwards for several yards as we left the park, mesmerized by the ever-changing, shimmering glow and off-shooting flares. We walked back up to our house and laid down on the driveway to watch the night sky for a half-hour or so, later drifting to sleep on a comfortable bed, grateful for such a magical night. Next Next post: Oh Deer!